As someone who spends much of their time literally up in the air on a plane or rushing around on the ground, staying in hotels for me has often been just a place to land before an event or meeting. Somewhere to shower and sleep, and maybe enjoy a treatment in the spa. This year, however, my house in Son Vida has been undergoing an epic renovation, so quite often my family and I have been forced to escaped the noise and dust of roof raising in search of the comforts of home in hotels on Mallorca. We have become discerning, seeking out a sense of place that is less about thread count or slick service. 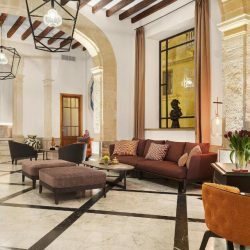 On a rainy weekend in March, in need of a break from the construction, we decided to take a staycation in Palma, and spent the night at the newly opened boutique Hotel La Gloria de Sant Jaume. Dreary weather is unusual on Mallorca, but for me it brings to mind Ireland — where I am from — and I was nostalgic. Not for bricks and mortar, I was longing for the feeling of home. Hotel La Gloria de Sant Jaume is situated on an authentic narrow camino in Palma´s historic center. Horse drawn carriages pass by on the cobblestone street, and church bells chime the hour. Built as a nobleman´s manor house, the building has undergone a painstaking renovation by hoteliers Heidi Wolf and Jordi Cabau. Original features of the 16th-century mansion have been restored, and the attention to every detail, from hand-hewn bannisters to a personal wine list, reflects the passion the couple have for the 14 rooms of the hotel. We were offered a drink by the friendly receptionist before being led to our room — a bright airy bedroom comfortably decorated with exquisite objects and paintings from the owner´s personal collection — and we felt immediately as if we were guests of friends. The only thing missing was a kettle for tea in the room (there was only coffee), and a side table beside the cosy chair to set a mug on would have made for a dreamy rainy afternoon curled up with a book. Instead, my husband and I decided to explore the subterranean spa, and put on plush robes to go downstairs. For a boutique hotel, the spa is impressive, with a lap pool, sauna, and lovely chaises in the original stables of the building. Relaxed and refreshed, we dressed for dinner and settled into cosy jewel-toned velvet armchairs in the bar with a glass of cava before dinner. The restaurant is snug, and brings to mind old hotel bars of Europe. When good friends joined us for dinner the spirited conversation lifted the ambience, and made for a jovial evening of drinking wine and sharing traditional tapas. Up to bed we went, to slip between the luxurious sheets. Our room looked out over the rain-wet streets and in the quiet of the night it was picturesque and we slept well. In the morning if you like a lie in, you might opt for a quieter room at the back. Now familiar with the hotel, and feeling very much at ease, we made our way down to the breakfast buffet. A cup of black tea and a delicious poached egg on smoked salmon was the perfect comfort food for me. I would recommend Hotel La Gloria de Sant Jaume for anyone who wants to feel that they have ‘arrived’ in Palma. 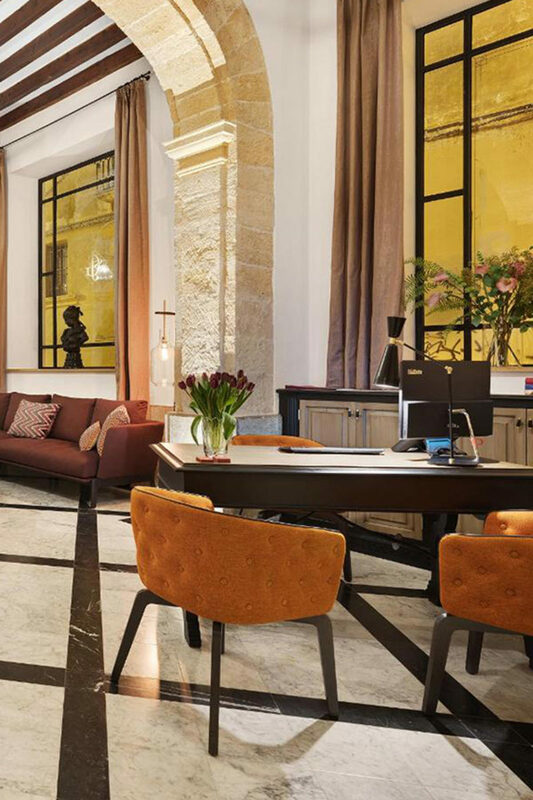 The authentic Mallorcan city palacio, painstakingly restored, stands proudly on the narrow Sant Jaume street, just a stone’s throw from the most important city landmarks, making it the perfect boutique hotel choice for a weekend escape.